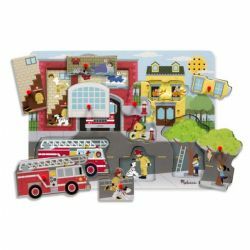 This sound puzzle lets kids discover a fire alarm waking up a sleeping firefighter, a fire crackling in an apartment, a cat being rescued from a tree, and much more. Replace the piece to immediately stop the sound and move to the next scene! Ages 2 and up.